On these gourds, Patrick Loafman combines pyrography with carving and leather dyes, shoe polishes, ink pens, watercolor and some acrylic paints for coloration. "The design is inspired by the osprey, a bird that dives for fish along the Elwha River close to my home." "This side of the gourd depicts a realistic woodburned eagle and just out of view below the eagle's talons is the local native word for eagle." "This gourd has something different on each side. This side shows an abstraction based on the bald eagle. The white areas have been carved. "I wooburned Eagle in Chinese calligraphy here." "This is a food-safe gourd bowl with lid, a blue heron design on top, dyed with leather dyes and a unique carved background." "I deeply carved out the background around this turtle. The gourd is opened at the top and could be used as a vase." "A very unique woodburned and carved gourd. Click for addtional photos of this one, it has different images all over it. Lots of detail." 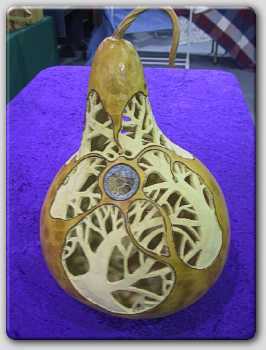 "I inlayed a fossil Ammonite in the center and carved out the background of this gourd. It is a covered bowl that you could put votive candle or battery-powered push light inside."